For self-awareness and personal development highly recommendable, for exploiting the ocean maybe not so much. Even though the deep-sea floor is „the most abundant habitat type on Earth. And we know almost nothing about it.“ Conservation International is pointing out the environmental threats of this new underwater hype. The first deep-sea mining Solwara 1, which aims to mine the Bismark seabed for high grade copper and gold, in Papua New Guinea by Nautilus Minerals, a Canadian company, stays highly controversial. 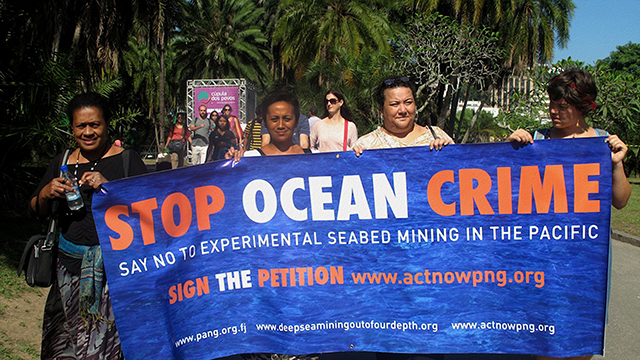 Papua New Guineans are far from happy about the project and are calling for it to ban experimental deep sea mining while the company is downplaying the risks. I blog quite often and I seriously appreciate your information. The article has truly peaked my interest. It has taken decades of public awareness programmes and educational literature to make people start to take responsibility for the environmental disasters that have been caused by lack of waste management and recycling. This situation needs a proper disposal of electronic equipments. The older cabinets and stands have great depth to accommodate the deep body of the electronic component. I found a sea shell and gave it to my 4 year old daughter and said „You can hear the ocean if you put this to your ear.“ She put the shell to her ear and screamed. A motivating discussion is definitely worth comment. There’s no doubt that that you should publish more about this topic, it might not be a taboo matter but usually people do not talk about such subjects. To the next! All the best!! blog that’s both educative and interesting, and without a doubt, you have hit the nail on the head.